Former Miami captain Tommy Wingels dropped the gloves for the first time in his NHL career tonight and came away with the decision in the Sharks’ bad 6-3 loss to the Columbus Blue Jackets at Nationwide Arena. What was extra satisfying about the fight is that he decisioned former Ohio State hack Buckeye, R.J. Umberger. You could say it was a passing of the torch. In the post game press conference after Miami’s 4-3 overtime loss against Boston University, sat three people- RedHawks Head Coach Enrico Blasi, Captain Brian Kaufman, and Tommy Wingels. 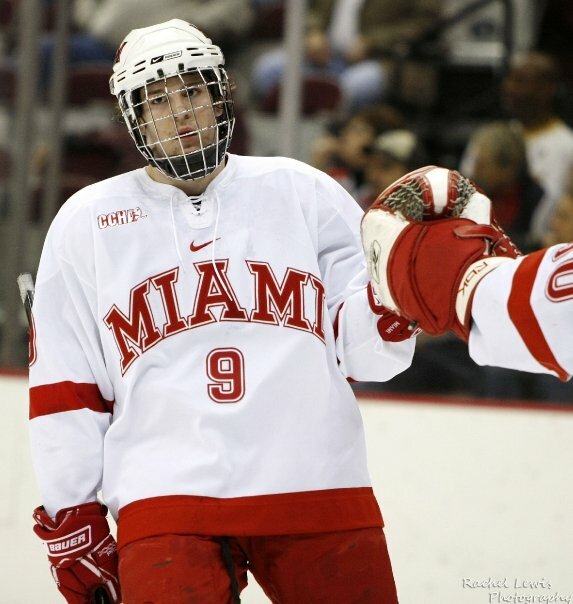 There could have been no better set up, no better stage to showcase what was the past, present, and future of the Miami captaincy, as the junior winger has been selected to lead the RedHawks’ as team captain in 2009-2010 and most likely, in 2010-2011 as well. Wingels, a 6th round pick of the San Jose Sharks in 2008, has quickly risen to become one of the shining stars of a very young Miami hockey program and carries himself with the true “Brotherhood” mentality. Having finished the 08-09 campaign with 11 goals and 17 assists, the Wilmette, Illinois native realizes that the RedHawks’ may have been down on that chilly April night in D.C., but they weren’t out. Alternate captains for the 09-10 season have yet to be determined. Miami RedHawks sophomore Tommy Wingels was selected by the San Jose Sharks with the 177th overall pick in the 2008 NHL Draft. As a freshman during the season, Wingels had 15 goals and 14 assists, for a total of 29 points.